Russia was a customer and prolific user of the Austin series, imported from Austin Motor Co. Ltd, Great Britain since 1914. Production was reserved entirely for Russia (and on Russian specs). The latest, the series III, was ordered on 25 August 1916 and integrated the sum of experience collected since the beginning of the war. These were delivered in early 1917, yet in the meantime another order came for an enhanced series (which would have been the fourth) to be delivered in late 1917. 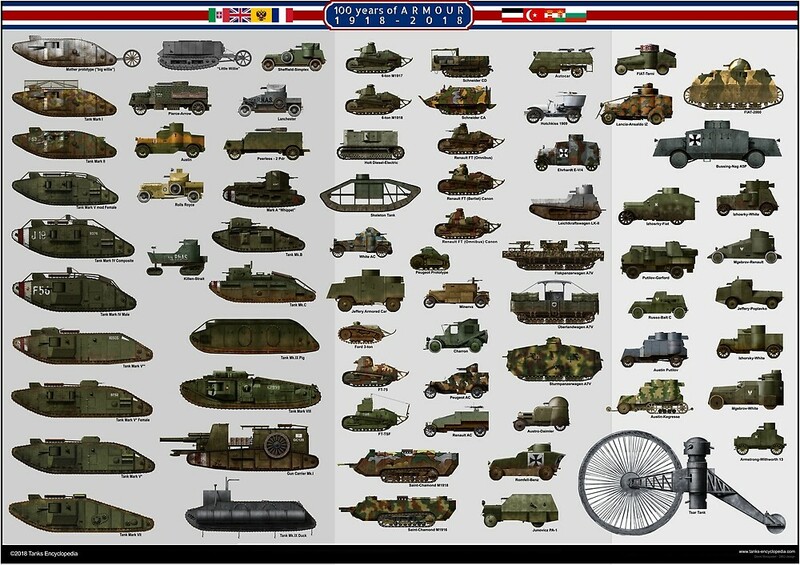 The Revolution erupted before and the vehicles were kept in British service. Series 3 Austin serving with the Cossacks, Civil War era (notice the front hood roundel). The series 3 was much heavier than the previous series 1 and had two turrets in a tandem arrangement. 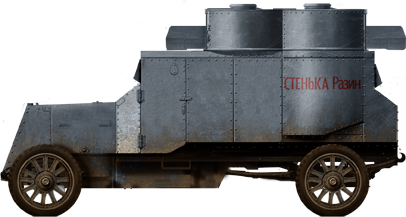 In 1916, the decision was taken to order only the chassis from Austin, and the armored body was to be completed locally by the Putilovski Works at Saint Petersburg. Therefore, 60 Series III chassis were ordered and shipped. It was estimated their completion took place in July 1917. However, the turmoil of the Revolution brought all work to a halt, as stated by Staff-Captain Ivanov. It was eventually resumed by a few workers and the first two vehicles rolled out in March 1918, while Russia was no longer at war. Due to the lack of equipment, spare parts, even gasoline, all vehicles were transferred by rail to the Izhorski Works. Production resumed there from the summer of 1919 to spring 1920, after 33 vehicles had been delivered in total. Interestingly enough, the designation “Austin-Putilov” (Остин-Путиловец – Ostin-Putilovets) is not attested in any document, but was coined later by historians. Instead they were called Русский Остин – Russkij Ostin or “Russian Austins”. The Vrag Kapital, a surviving Austin-Putilov currently at the Artillery Museum in Saint-Petersburg. The vehicles created by Putilovski Works and later Izhorski Works were virtually identical, integrating many ideas developed for the undelivered Austin series IV. They were characterized by a bulky, heavier hull and thicker armor (7.5 mm instead of 6.5 mm) and by diagonally opposed turrets with Maxim liquid-cooled machine guns. These gave a better field of fire, but also allowed the installation of a door on the right side of the vehicle. Overall weight was now 5.2 tons and the road speed remained about the same, with a maximum of 55 km/h (34 mph). The range was 200 km (125 mi). These Austin-Putilovs, just like the Austin series III they were derived from, were twice heavier than the 1914 series I Austins (2.66 tons)! Captured Austin-Putilovets «Poznańczyk» near Bobruysk, Poland, 1920. The vehicle had a crew of five. The commander sat next to the driver in the front, while two machine-gunners and one loader/mechanic were housed in the rear fighting compartment. In addition, there were duplicate steering controls at the rear for reverse driving, hence the protruding rear. 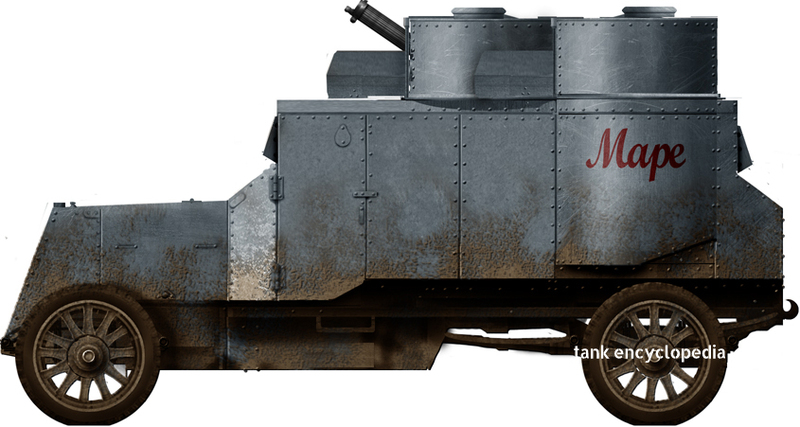 Vision was provided by a large armoured folding windshield and side armoured shutters with four pistol ports. As customary, the machine-guns were protected by blocking screens in order to avoid any collisions when traversing. They had revised mounts, allowing full elevation and enabling them to provide AA fire. The interior was layered with felt in order to protect the crew from metal splintering. The front road wheels were also protected by fenders. 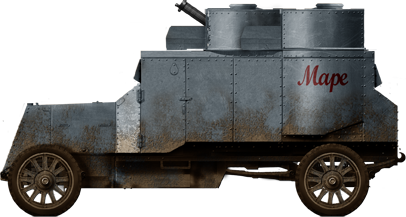 At the same period, the Austin-Kégresse was developed, as the first military half-track. Both shared the same chassis and hull. Originally, 39 Kégresses were planned, whereas ten Austins would have been delivered each month until 15 June 1917. The whole schedule was thrown off because of the late delivery of chassis. The first arrived in late January, and 20 had been obtained by February 1917. The Austin-Kégresse, developed using the standard Austin-Putilov chassis and hull. It was the world’s first military half-track. 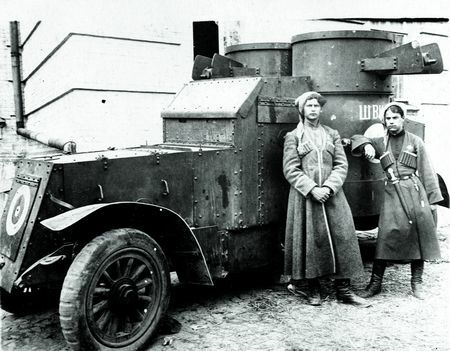 These vehicles were pressed into service by the Red Army in the Civil War, in motorized platoons called “armored automobile units” (броневой автомоильный отряд or bronevoy avtomobilniy otryad), with three MG-armed cars, one gun/MG-armed, four staff cars, five trucks, plus a tanker, workshop trucks and four motorcycles. They saw action against the “white Russians”, but also independent groups or Ukrainian warbands and armies, and some were captured and reused by those. 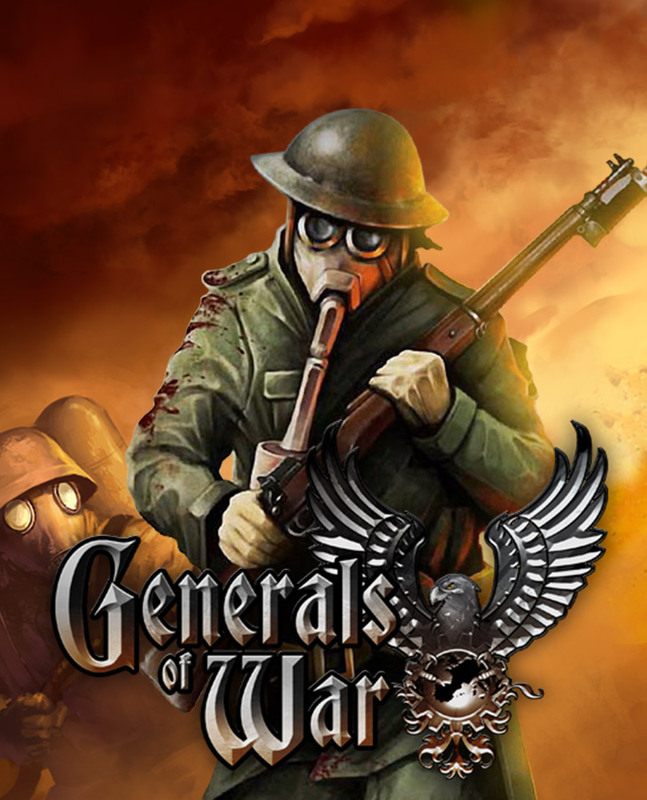 They also participated in the Polish-Russian war of 1920, and at least one was captured and stayed in service with the Polish Army until the 1930s. 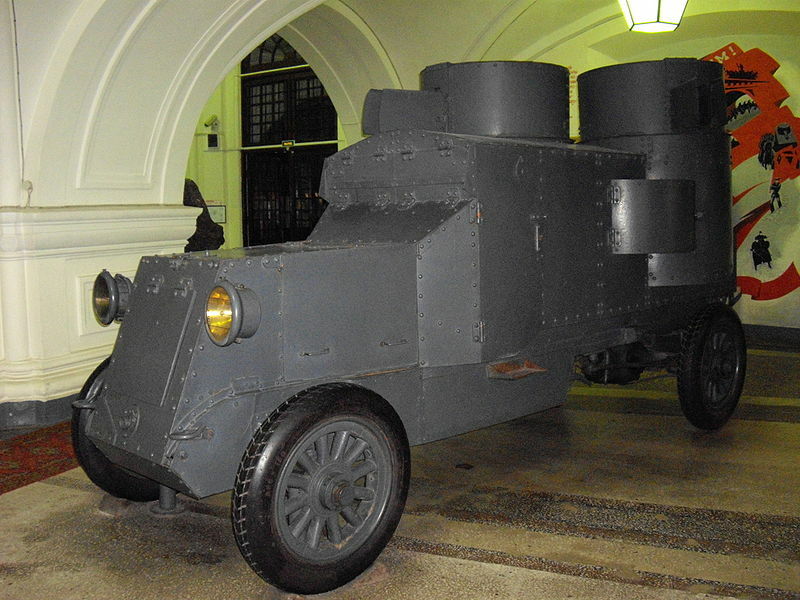 By 1921, the RKKA (the future Red Army) had only 78 Austins still in use, Putilovs included. The last ones were retired from service in 1933. Today, the “Vrag Kapitala” (Enemy of the Capital) is displayed at the Artillery Museum in Saint Petersburg, falsely attributed to be the one on which Lenin stood for his famous speech. However, that vehicle also exists, and it is housed at the Kubinka tank museum near Moscow. Another one is displayed at the Izhorski Works, in Kolpino, St. Petersburg. “Styenka Razin”, 1920. It was captured by the 55th Infantry Regiment of the 14th Wielkopolska Infantry Division during the Soviet-Polish war and renamed “Poznańczyk”. 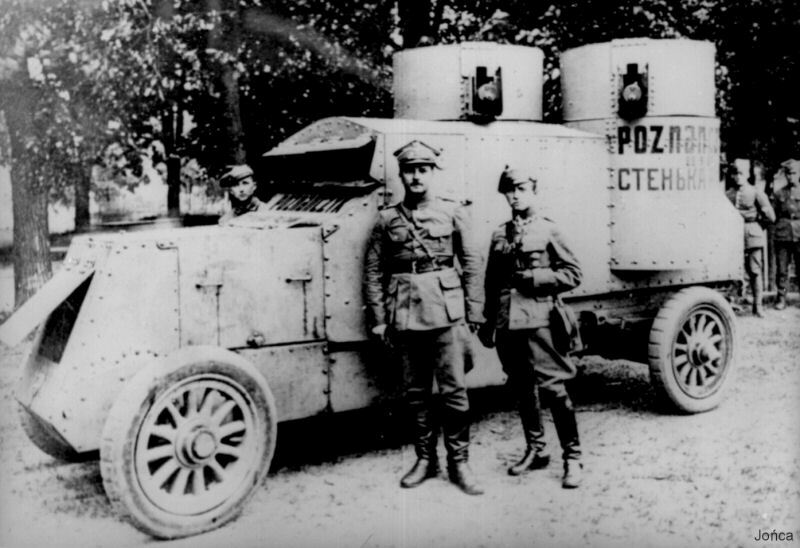 It was reused in the Wielkopolski Armored Car Platoon. 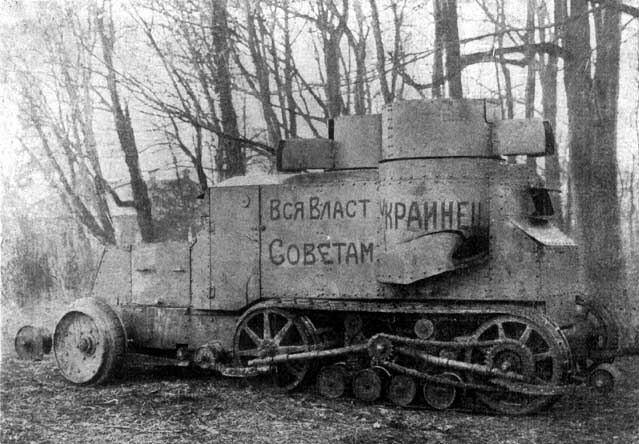 Another Austin-Putilov, in 1920, during the Polish-Soviet war. As customary, these vehicles were individually named by their crews. It seems nearly all have been delivered with a neutral grey paint, or possibly pale olive, photos can\’t really tell, but it’s unlikely as the paint would have been available from the Naval stocks.